Squash is my one of my favorite foods in fall and winter. While playing in my kitchen one day, I came up with a yummy recipe idea for Twice Baked Acorn Squash Stuffed with Cheese and Corn, plus jalapeños and scallions. This Mexican influenced recipe is super tasty and filling, which is great for a vegetarian main dish. 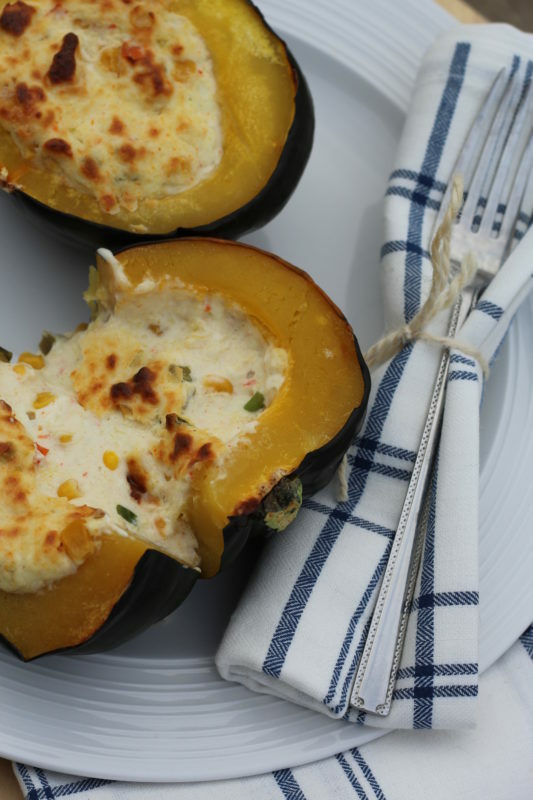 A quarter of a squash also works great as side dish alongside a meat entrée. This post contains affilaite links. Please see my disclaimer in the top bar menu for more details. Thank you:) Thanks for visiting my site! I love the longevity of the shelf-life of squash. It can last for a very long time on your counter before it starts to rot, therefore it’s a great food to keep in your kitchen for a last-minute addition to a meal. 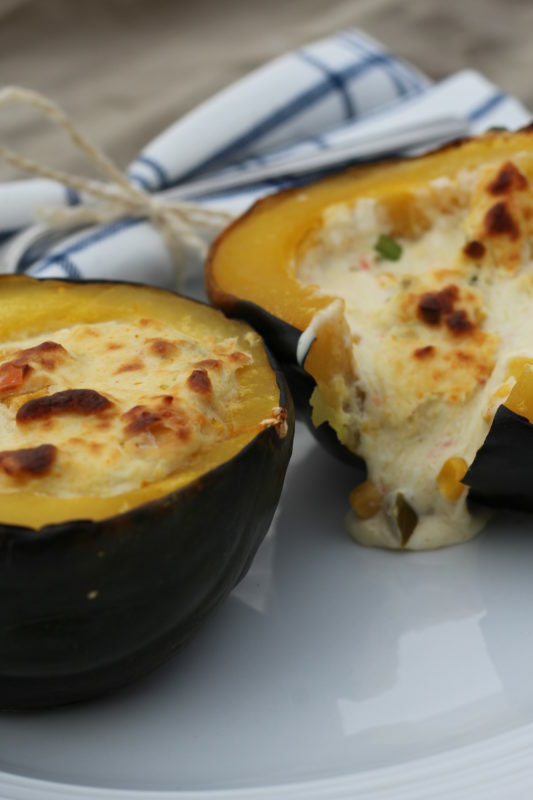 Squash is a healthy and versatile food that pairs well with many other foods. Plus, there are so many varieties of squash to choose from. Please feel free to scroll down to easily print this recipe if desired. 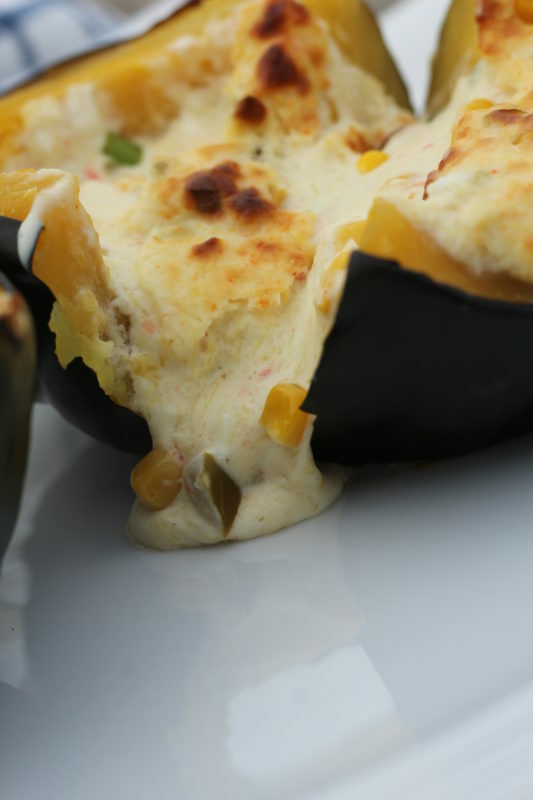 I’m a fan of the twice baked potato recipes, so I thought I’d try out a twice baked acorn squash recipe. This recipe is really easy to make with easy-to-find common ingredients. I love food with a bit of spiciness, so Mexican food is a favorite of mine. For this recipe, I decided to try using American Neufchâtel cheese and Queso Fresco. I like the lower fat and calories of the Neufchâtel cheese when compared to cream cheese, and I love the easy crumbling characteristic of the Queso Fresco cheese. Both cheeses are soft and blend well together. I did not salt the squash and it was tasty, but go ahead and add that if you want. However, I feel Queso Fresco cheese is a bit salty, so in my opinion, the cheese takes care of any need for extra salt. This is an easy recipe that takes very little effort to make and it’s delicious! That’s a win-win in my book! I often eat this as my main course as a vegetarian. I eat half of a squash and it is filling enough to be my main dish. The cheeses make this dish satisfying and add protein. However, if I’m having it as a side dish, I will only take a quarter of a squash. My husband does eat meat, so he often takes a quarter of a squash as a vegetable side dish to his meat entrée. 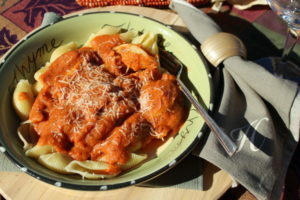 I like eating this recipe as my main dish also because it doesn’t contain any carbohydrates. I try to eat meals now and then that are either low-carb or without carbs altogether to cut calories and eat more healthy. I hope you enjoy all these squash recipes! I get excited about yummy recipes, I hope you enjoy this one. Eat well and enjoy life! Squash is my one of my favorite foods in fall and winter. 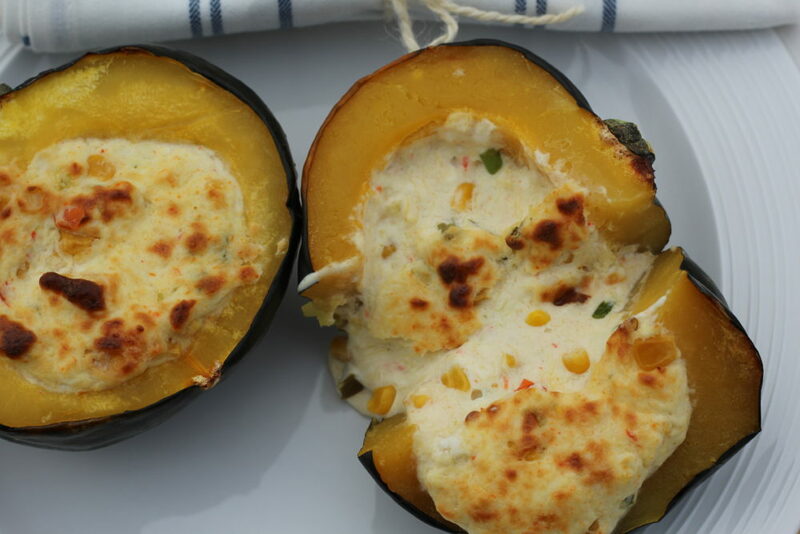 While playing in my kitchen one day, I came up with a yummy recipe idea for Twice Baked Acorn Squash Stuffed with Cheese and Corn, plus jalapeños and scallions. This Mexican influenced recipe is super tasty and filling, which is great for a vegetarian main dish. 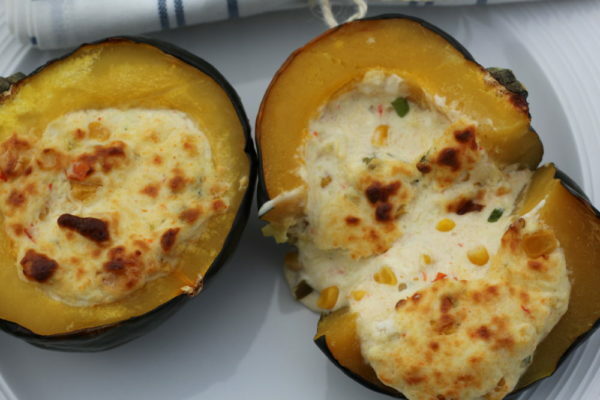 A quarter of a squash also works great as side dish alongside a meat entrée. This is an easy recipe that takes very little effort to make. It is delicious! Slice acorn squash in half and scoop out insides and seeds. Place upside down in a pan with sides with a bit of water and cook at 400 degrees for about 35 minutes until soft to a fork pierce. Remove squash from the oven. I prepare the cheese/corn mixture while the squash is cooking. Combine 8 oz. 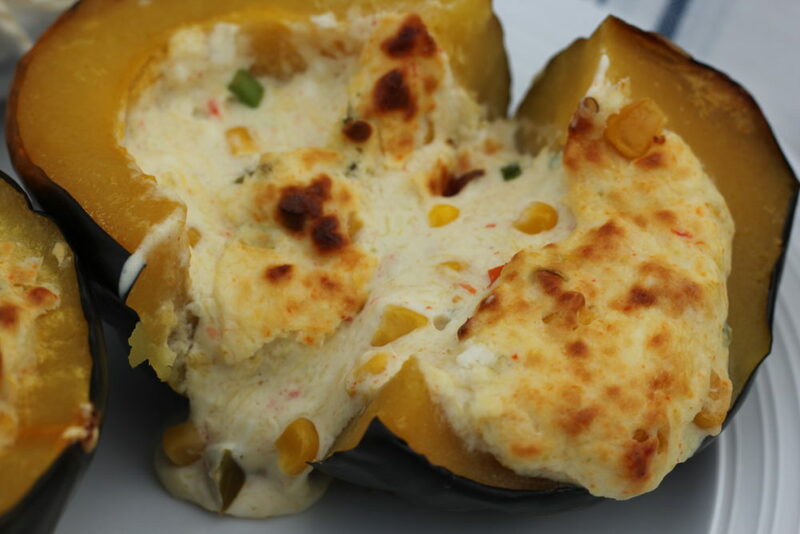 softened American Neufchatel cheese, 1/2 c. Queso Fresco cheese crumbles, 1/2 c. corn with red and green peppers, 1 Tbsp. canned jalapenos, 1 Tbsp. finely chopped scallions and stir. Scoop out the squash from one of the halves of acorn squash, leave the rest of the squash halves intact. Add 1/2 cup. cooked acorn squash to cheese and corn mixture and stir well. Add 1/3 cup cheese/vegetable mixture to each of the five squash halves. Cook for about 15 minutes at 375 degrees. Then broil for 15-20 minutes on low or until cheese turns golden, watch near end so the cheese doesn't burn. Serve immediately. This squash recipe is also good as a leftover. Store leftovers in the fridge and heat in the microwave before enjoying. I love squash in the fall as well! 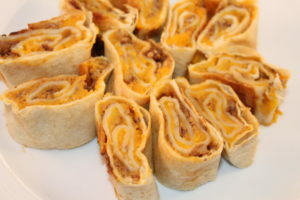 This recipe looks so delicious and easy to make! 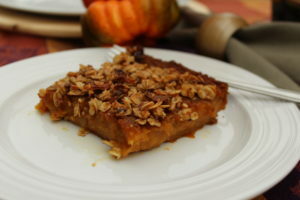 I will definitely put it in my fall recipe rotation. It’s super easy and so yummy! I hope you enjoy it! I adore acorn squash as it is, then including these toppings really puts it over the edge. Sounds wonderful! It’s super yummy! Thanks! I hope you enjoy! Wow! This looks super good. I never though to cook acorn squash this way. It’s so good! I hope you enjoy it!! This looks so good and quick! Thanks for the post! It’s very easy! I hope you enjoy! Thanks! !